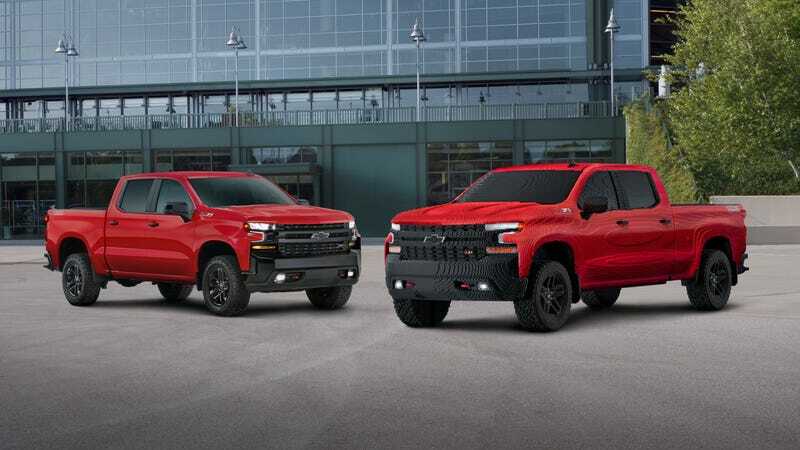 Chevrolet has had its fair share of drama lately, between the atrocious grille on its 2020 Silverado HD to the uproar about its commercial claiming its vehicles are more reliable than—oh, look, a big truck made out of Legos! What were we talking about, again? Chevy brought a full-size Silverado made out of Legos to the Detroit Auto Show a few days ago, which 18 people spent more than 2,000 hours on for no purpose other than its display and promotion of “The Lego Movie 2: The Second Part.” It remains to be seen whether Lego will hire actual title writers for future films. The Lego truck is a replica of the 2019 Silverado 1500 LT Trail Boss with lights and badges, and the two look incredibly similar—far more similar than the real Porsche 911 and its Lego version that looks like a homicidal cartoon frog. Chevy said in a press release that the final Lego truck came out to six feet tall and 20 feet long, thanks to a full 334,544 bricks. It also weighs 3,307 pounds, which is only 1,100 pounds lighter than the lightest V8 Silverado 1500, which has an engine and all of that important stuff in it. Anyway, the truck is here for all of us to “Ooh” and “Aah” at until we inevitably forget that it exists, moving onto some other obvious promotional scheme that happens to be cool. That’s life, as dictated by the brands. In the meantime, there was no word from Chevrolet on whether surveys say its Lego truck has more bricks than anything made by Ford, Toyota or Honda.